Poll: Do you have a problem with on-street advertising boards? DCC has previously removed unlicensed boards from Dublin’s streets. Advertising boards in Dublin's Temple Bar. 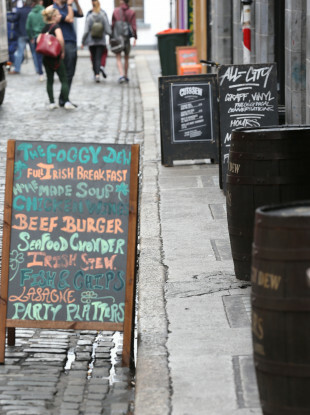 A REPORT IN today’s Irish Times says that Dublin City Council is to clamp down on unlicensed advertising boards on the capital’s streets. City manager Owen Keegan told the paper that, while there are restaurants that pay for licensed on-street tables and chairs, there are no licenses for advertising boards. Restaurant groups argue that such boards are effective in attracting both local customers and tourists. Disability groups have also pointed out that the boards can be restrictive for wheelchair users. Poll, Do you have a problem with on-street advertising boards? Email “Poll: Do you have a problem with on-street advertising boards?”. Feedback on “Poll: Do you have a problem with on-street advertising boards?”.